The Text tool lets you add text fields to your project, in which you can type text, then adjust its formatting using various fonts and text attributes. With the Text tool selected, you can select text within text boxes you created and change the formatting of the selection. 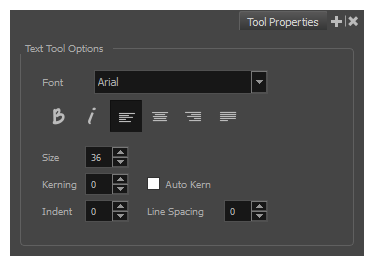 You can also select and manipulate text boxes using the Select tool, and change the formatting of the entire text box in the Select tool properties. 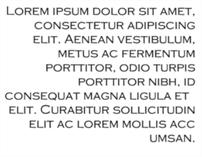 Lets you select the font in which to display the text. Makes the selected text italic. Aligns the text in the selected text box to the left. Aligns the text in the selected text box to the centre. Aligns the text in the selected text box to the right. 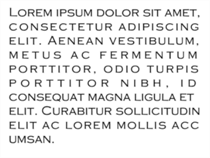 Makes the text in the selected text box take all the horizontal space by adjusting the spacing between each word. Text that use a single line and text in the last line of a paragraph is aligned to the left. Allows you to set the size of the selected text. Allows you to increase or decrease the spacing between each character. 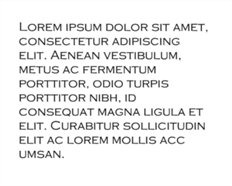 Sets the kerning automatically based on the font’s predefined standard. Allows you to increase or decrease the indentation of the first line of text in each paragraph. 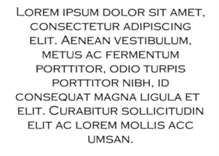 Increases or decreases the space between each line of text.